Machine-made right here in the USA, in Fort Lauderdale, Florida, Backwoods Original Cigars made their national debut in 1981 and they’ve been a favorite for casual cigar smokers ever since. Marketed as a rugged smoke for the outdoorsman, Backwoods cigars airtight foil pouch and rustic look with its frayed end, tapered body, and unfinished head appealed to the manly man, especially those who grew up watching spaghetti westerns in admiration. Now largely disregarded by the premium cigar crowd due to their budget-priced, machine-made status, when Backwoods first hit shelves they were actually an upgrade in American domestic cigar quality. Backwoods introduced an authentic all-tobacco cigar to a market dominated by inexpensive brands that mostly used homogenized wrappers and binders. For many Americans, Backwoods presented their first taste of a “real cigar.” The one year aged Broadleaf wrapper on these primitive-looking sticks is what lends Backwoods its full, smooth, and sweet taste. 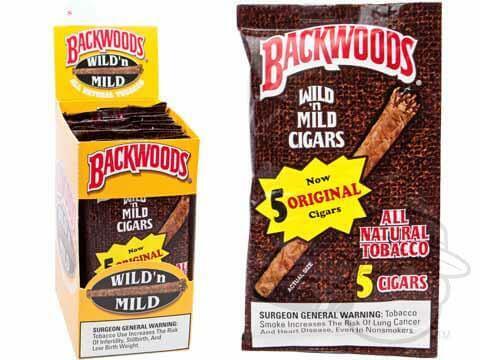 Since the success of the Original Backwoods, the brand has branched out to include a number of different flavored and non-flavored mellow blends. Backwoods Sweet Aromatic, Black N’ Sweet, Honey, Honey Berry, and even limited edition Backwoods like Honey Bourbon and Dark Stout have joined the ranks of the best selling machine-made cigars. They haven’t all been hits though – Banana, “Wild Rum,” and Grape-flavored Backwoods cigars were also introduced but did not make the cut and were eventually discontinued in the U.S. They are now widely sought-after by collectors and enthusiasts in America. Still an excellent source of “simple” stogie satisfaction that makes your lifelong wish to look as cool as Clint Eastwood come true, Backwoods remains the top selling “all natural cigar” in the world, and make a great companion when fishing, hunting, or during any other such macho activities. Though you probably won’t hear them bragging about it at the local cigar lounge, there are plenty of premium cigar smokers that keep an “emergency” pouch of Backwoods on hand to enjoy on occasions that don’t quite call for a “good” cigar. For an even more authentic Eastwood look, check out our BCP Cheroots. Made using a blend of premium Dominican Piloto Cubano and Kentucky fire-cured tobaccos, these rough little smokes pack a ton of smooth flavor and a mellow-medium body in two unique, tough-guy sizes. Even more affordable, and just slightly stronger than Backwoods, the rich taste of our BCP Cheroots will definitely leave you feeling lucky, punk. And don’t worry, if you should decide to add these classic “guilty pleasure” ‘gars to your stogie rotation, your secret is safe with us. Scouts honor, no backsies.